ABOUT TIME - Marco Beverage Systems Ltd. Spurred by David Walsh’s recent post on grind size and the villified omigrind, a latent bugbear of mine has been stirred from the far reaches of my oft-troubled mind. Namely where did these traditionally accepted norms for brewing (contact) times come from? Technology and physics inevitably provide the answers. Just as technology facilitated everything from the steel reinforced architectural marvels of the second half of the 20th century to the moulded consumer products of the same era, so too does technology and her master, physics, provide answers to where accepted contact times for different brew methods derive from. Let’s examine a few of those methods and the brew times associated with them. In all cases, we must remember, grind size and contact time are inextricably linked. It is undeniably true that, all other factors being equal, a fine grind will extract more than a coarse grind over the same contact time. You will also find if two brews have the same grind profile, the brew with a longer contact time will extract more. Why: The physical need for the wire mesh on an FP to allow its succesful depression while holding back solids and releasing liquid determines the mesh size. If ground coarse, the maximum of grinds can be caught by the mesh, which s good. Most commercial grinders yield less fines the coarser you grind. So coarse grind is required to maximise the FP as a brewmethod and coarse grinds need long contact time. How long? It depends on the actual grind chosen but 4 minutes has become the industry norm as a good average cloud collaboration tools. Why: The filter basket. Most of these brewers have a basket with an industry standard filter paper, which will hold up to 500ml comfortably. They will not hold a full brew of 1.8L (3 pints) without flooding. Physics dictates the need for a basket to have an exit hole to suit the incoming flow rate of water delivery. This relationship must to allow incoming water enough contact time with the coffee bed to extract correctly and allow the successful exit of the brew before basket flooding. Too fine a grind will choke the brew exit and flood the basket. Thus, what has become known as a filter grind or medium grind is used. The success of this medium grind is linked to so many other factors that a fixed contact time is impossible to prescribe. Hence, the rather loose standard of 4-6 minutes. Why: More brew volume out means more water in. If a 6 litre (3 gallon) brew is required, it physically takes a bulk filter (drip) brewer a longer time to pour 6L through the coffee bed while avoiding basket flooding. This longer contact time then determines the need for an increase in grind size,to avoid over extraction. Does this help: Bypass is an additional feature to facilitate operations and logistics of large volume brewing, rather than brew quality. It is the addition of hot water to a final brew, thus diluting the brew. 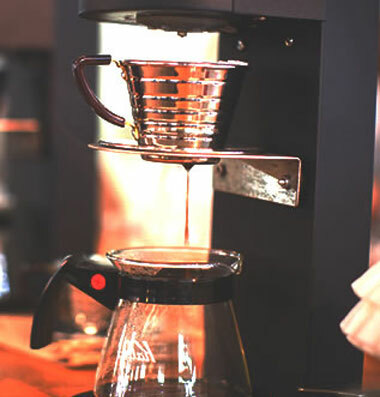 It exists for two main reasons – speed up commercial delivery of large brew volumes without flooding baskets and/or facilitate the same grind profile for smaller and larger brew volumes by maintaining contact time but compensating the stronger brew through dilution, thus suiting pre-ground packs for volume roasters. I could go on but to spend any more time will inevitably result in an undesirable level of bitterness, which really should be avoided!